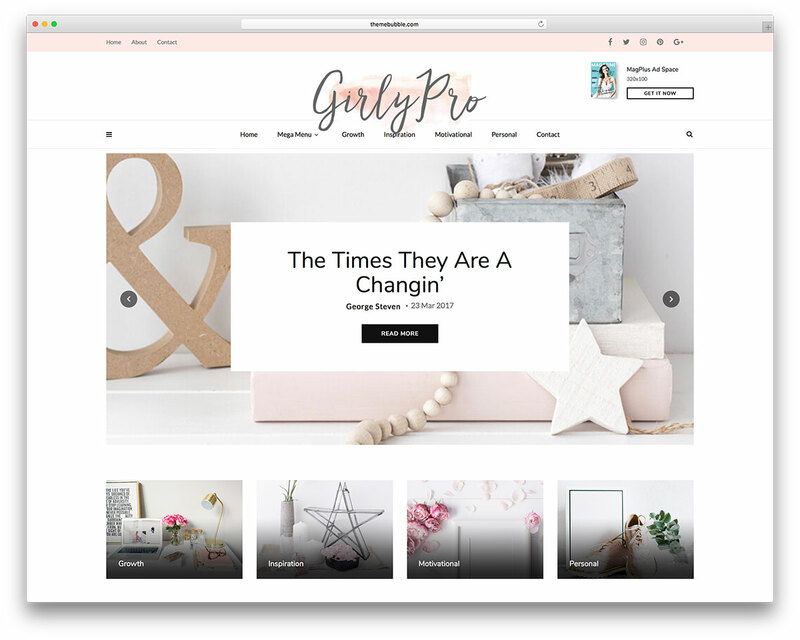 So, rebel against the patriarchy today with one of these beautiful, feminine fashion wordpress themes. 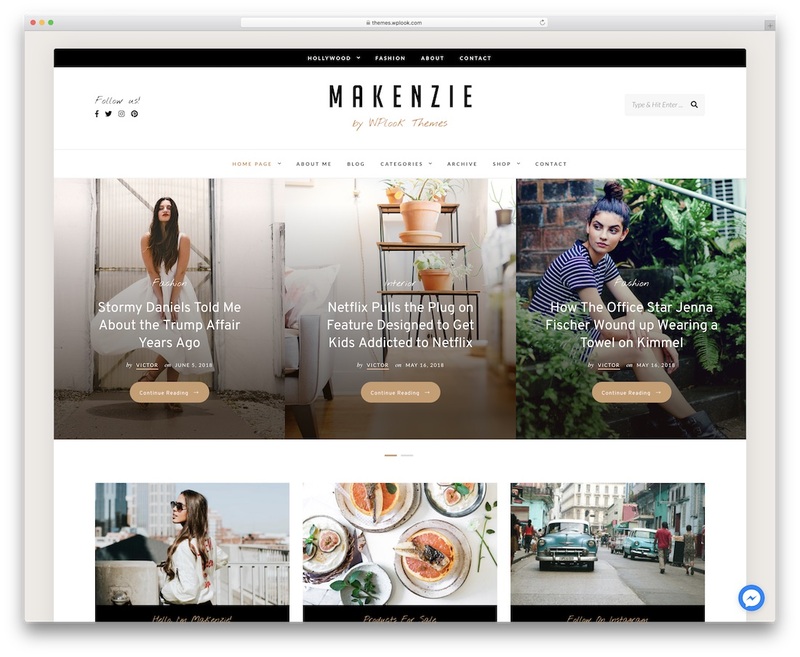 Makenzie is a stunning, visually appealing, attention sparking and phenomenal feminine WordPress theme. It is a versatile tool which you can use for all sorts of projects and intentions. Capri is an incredibly pliable, endlessly powerful, sizzling hot WordPress multipurpose theme, built the fulfill the needs of a great variety of websites, with a range of over a dozen equally stunning layouts that can be infinitely customized to your heart’s content with a whopping excess of two thousand options in the powerful included admin panel, meaning the possibilities of customizing your website are limitless. 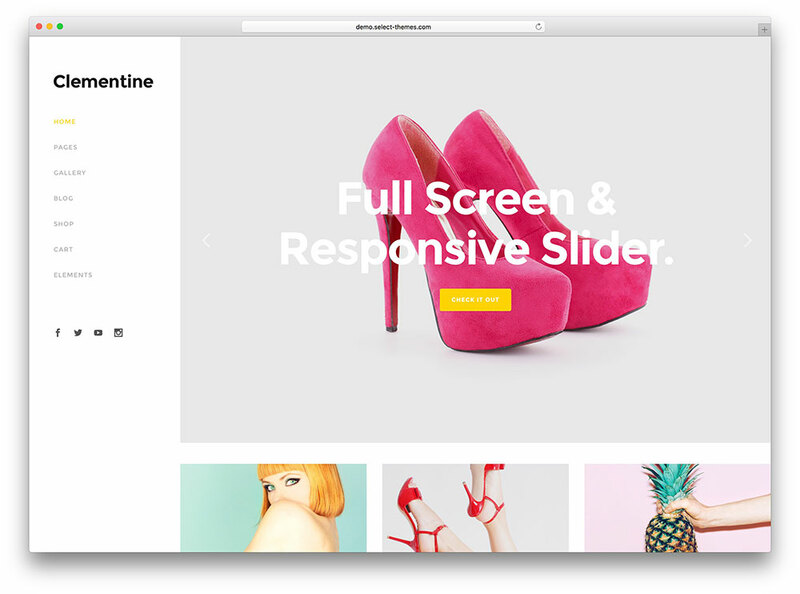 Christina is a clever and intuitive, gorgeous and seamless, tech-savvy and visually eloquent, rapidly responsive WordPress fashion and lifestyle blog website theme. 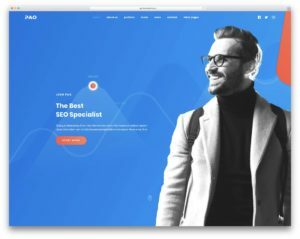 Anemos is a visually stunning and surprisingly dynamic, wonderfully intuitive and engaging, tech-savvy and rapidly responsive WordPress multiuse blogging website theme. 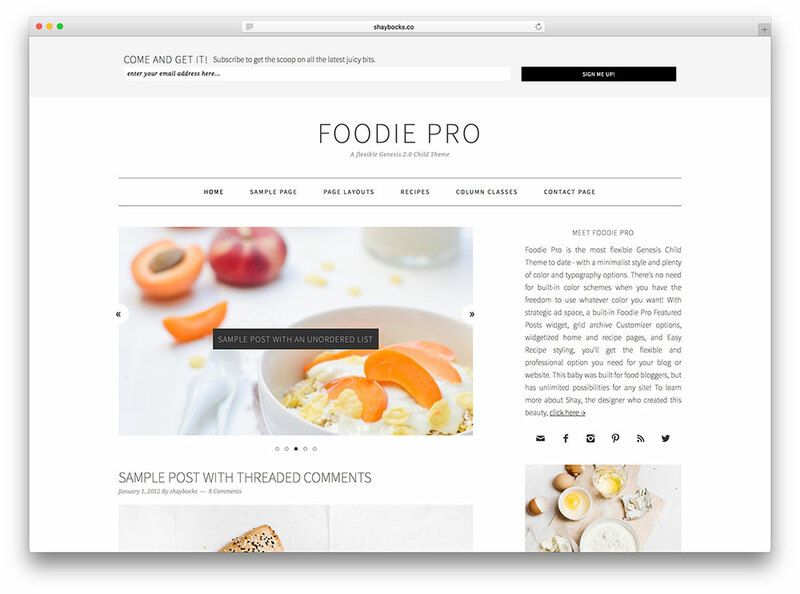 Foodie is a visually stimulating, boundlessly flexible, powerful yet understated WordPress theme. 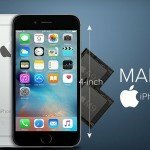 You can use this in essentially all imaginable purposes and to deal with all gastronomical delights, and websites specializing in them. Magplus is a crafty WordPress theme built for anyone with a dream. It offers 30+ unique stylish demos with topic variations and a strong panel. With its responsive design, one-click import and HD video tutorials it is as easy as saying “yes”. 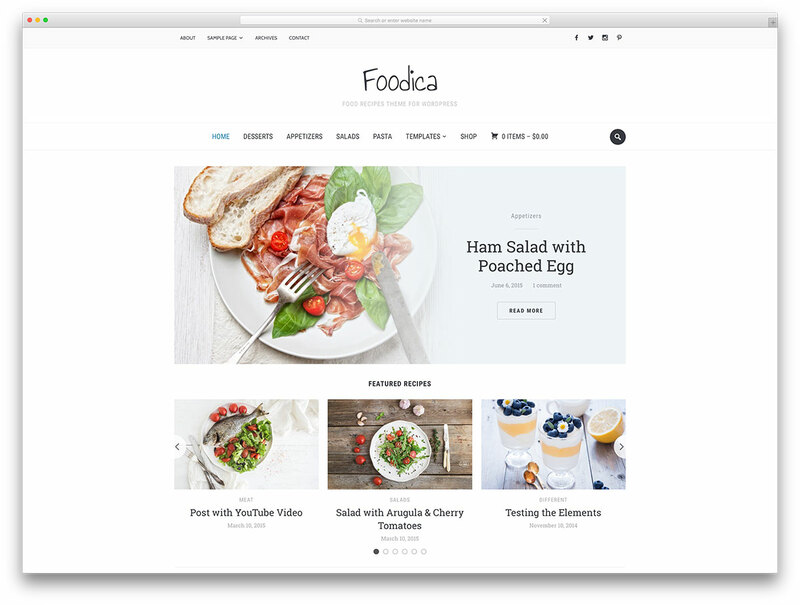 Foodica is a beautiful and very classy, cozy and inviting, warm and intimate, polished and aesthetically relaxed and sophisticated, very graphically customizable and supremely easy to navigate and user friendly, technologically feature-rich and intuitive, flexible and delicate responsive WordPress multipurpose website theme. 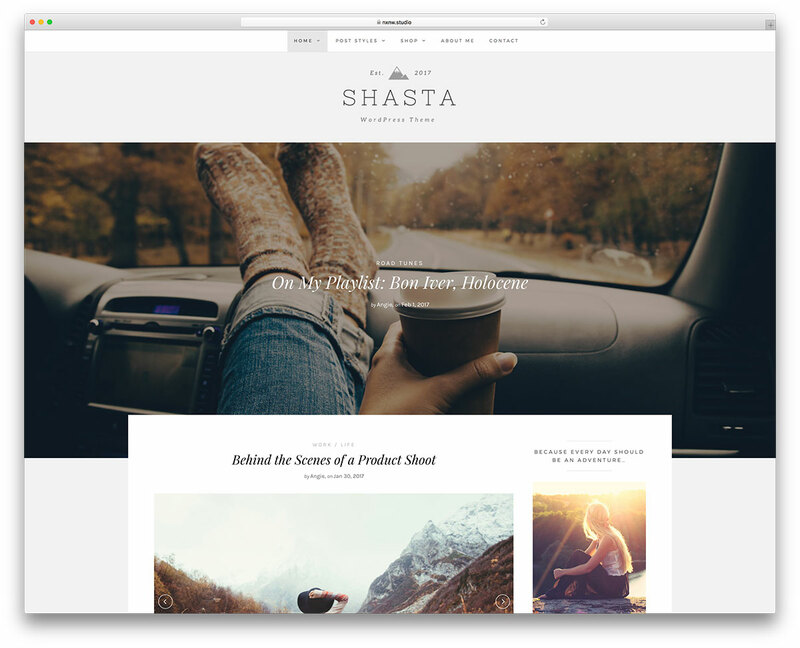 Shasta is a very specialized WordPress theme. It is best suited for a lifestyle bloggers. It offers 4 pre-built frontpage layouts and 3 page templates. You will find a theme ready for customizations. 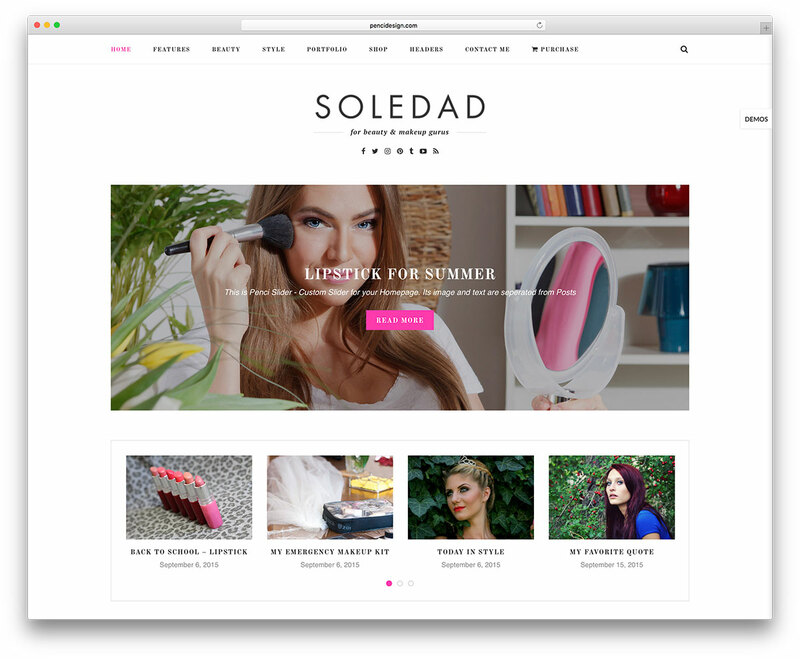 Soledad is an aesthetically refined and delicate, visually stimulating and highly sophisticated, experientially designed and amazing intuitive and easy to use, user and mobile friendly, technologically savvy and proficient while functionally flexible and pliable, modern and amazingly responsive WordPress multiconcept blog and magazine website theme. 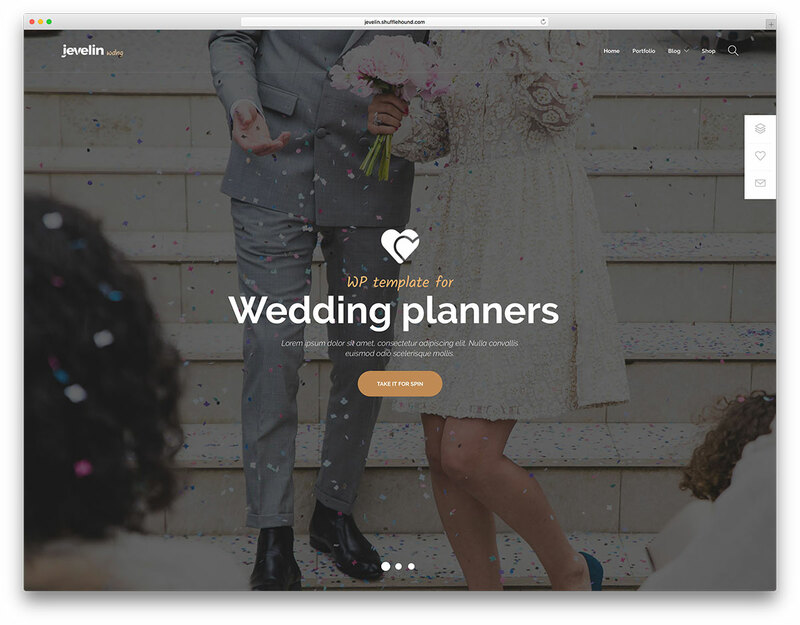 Jevelin is a clever and responsive WordPress premium multipurpose website theme. It’s a streamlined set of tools for crafting eloquent modern websites. 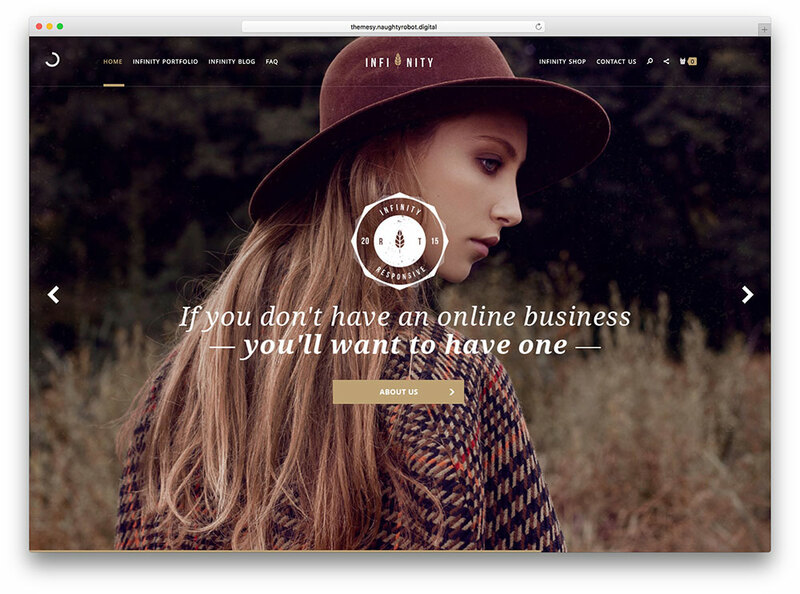 Parlour is a WordPress theme thought mainly for women and their needs. The designers created it in an enchanting way to allure any woman to make a visit to your site. But, at the same time, underneath, like a woman, it is also powerful. Parlour uses many features that give speed, flexibility and efficiency. 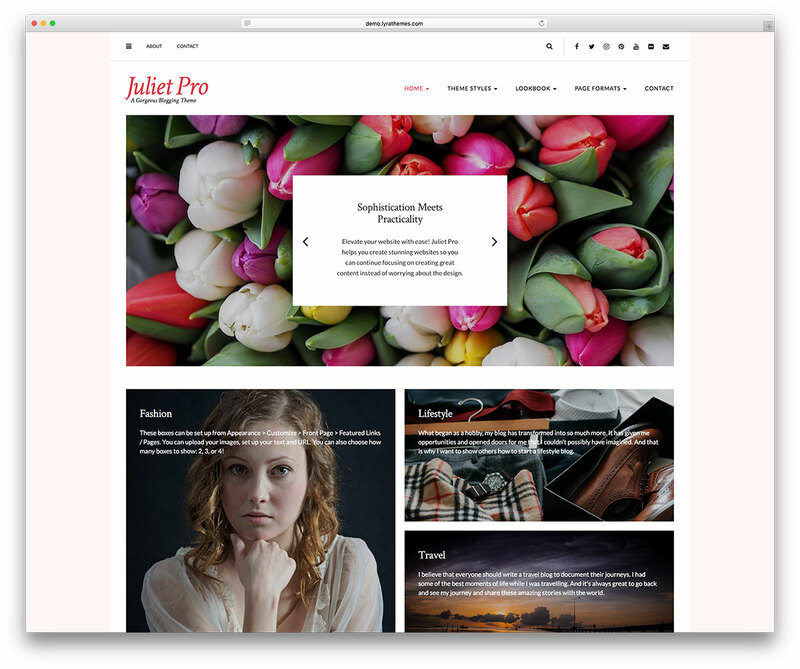 Juliet is a specialized blogging WordPress theme. Easy to set up and personalize. The creators designed Juliet to have a girly and elegant concept, beautiful and yet appealing. 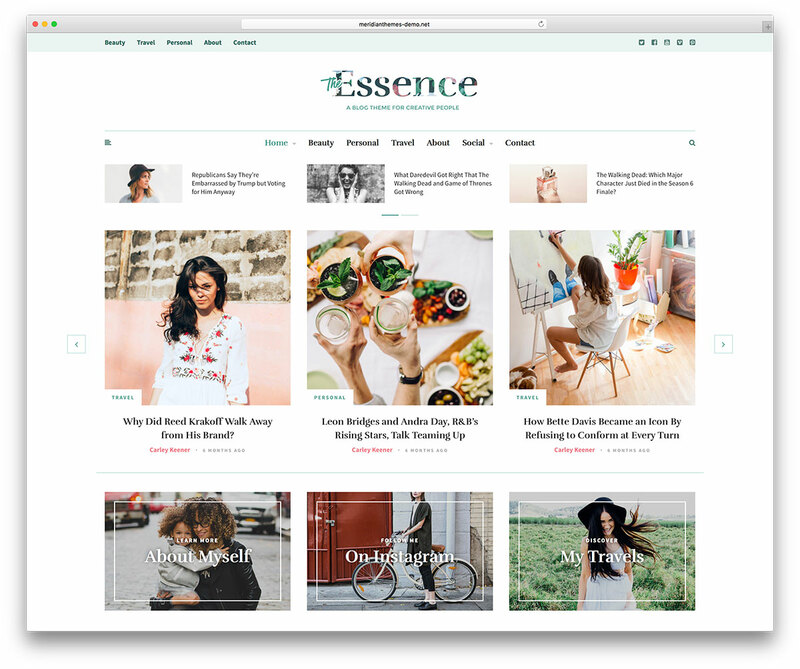 The Essence is an attractive and dazzling, minimalist and clean, fresh-faced and easy to use responsive WordPress blog website theme. 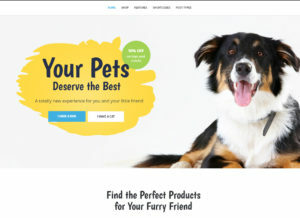 The designers crafted this theme to provide an intuitive platform for webmasters and to create the most engaging magazine and blog websites on the market today. 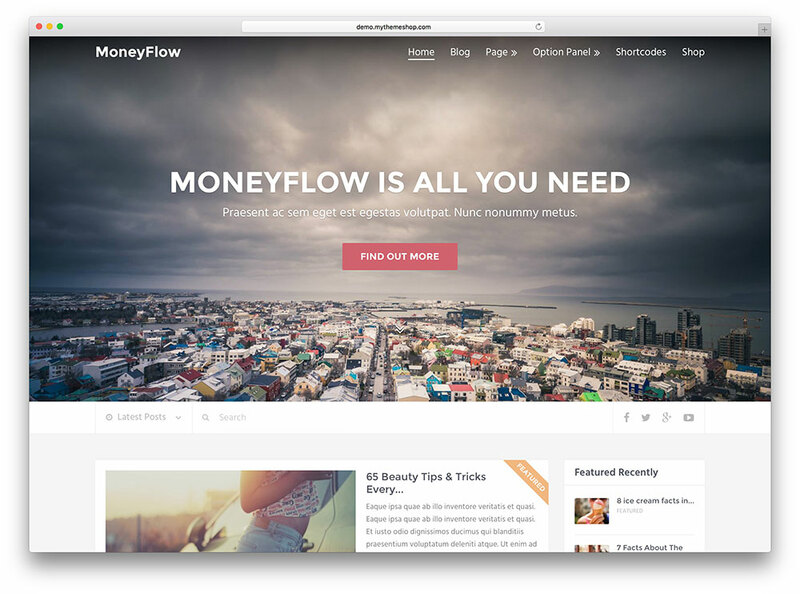 MoneyFlow is a modern, professional, businesslike WordPress theme, built around the needs of those seeking to establish their financial independence via Internet-based revenue streams. 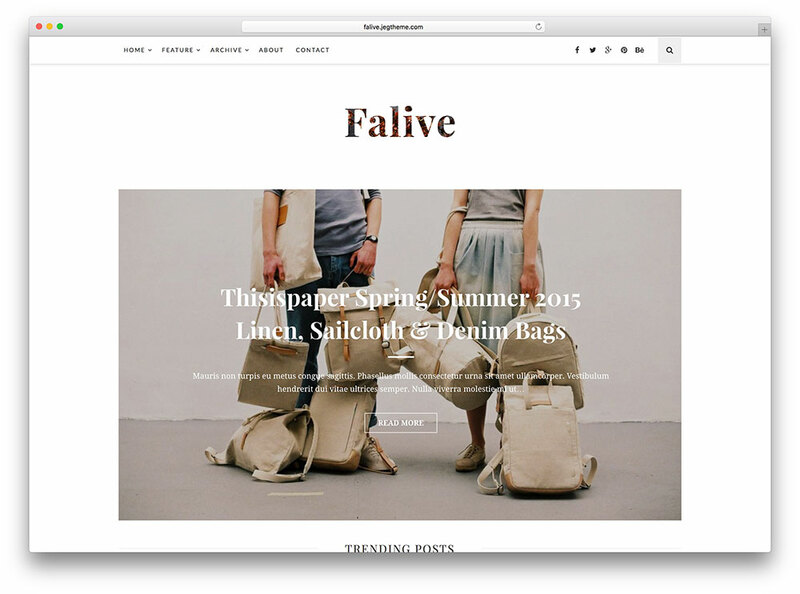 Falive is an incredible, beautiful, creative WordPress fashion and blog theme, constructed with the needs of fashion industry related news and blog type websites. 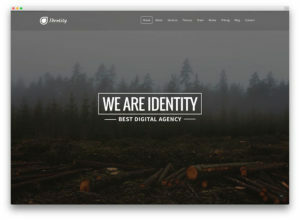 Themesy is an incredibly flexible, customizable, gorgeous WordPress multipurpose theme, designed to be an be-all theme solution for your website. 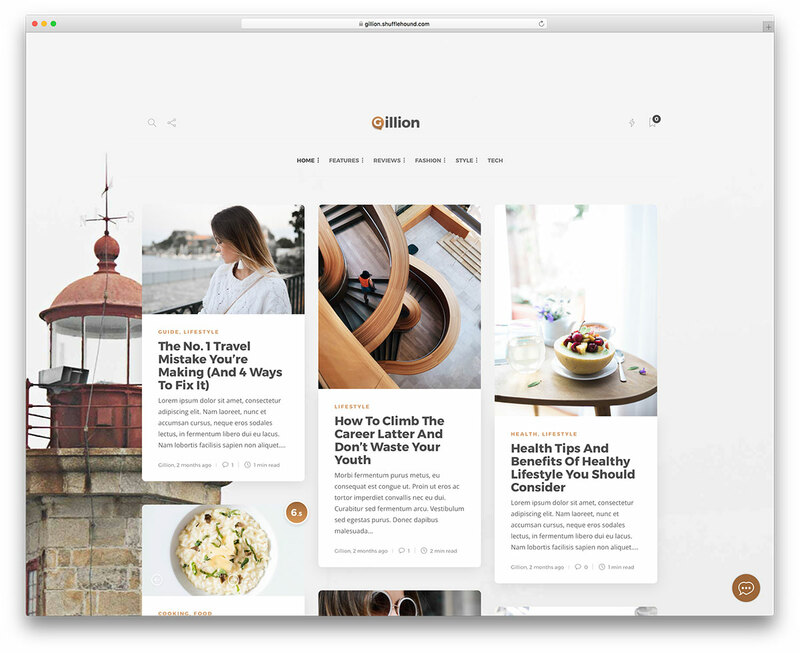 Gillion is a WordPress theme oriented to magazines and publishing or writing aspects. 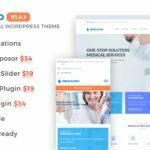 It uses Visual Composer as page builder and Unyson as framework. You can get it with it 7 demos of one-click install. Zarja is a creative, whimsical, classy WordPress Feminine Personal blog website theme, ideally suited for the needs of female webmasters wishing to set up their own personal website or blog of any interest or concentration. 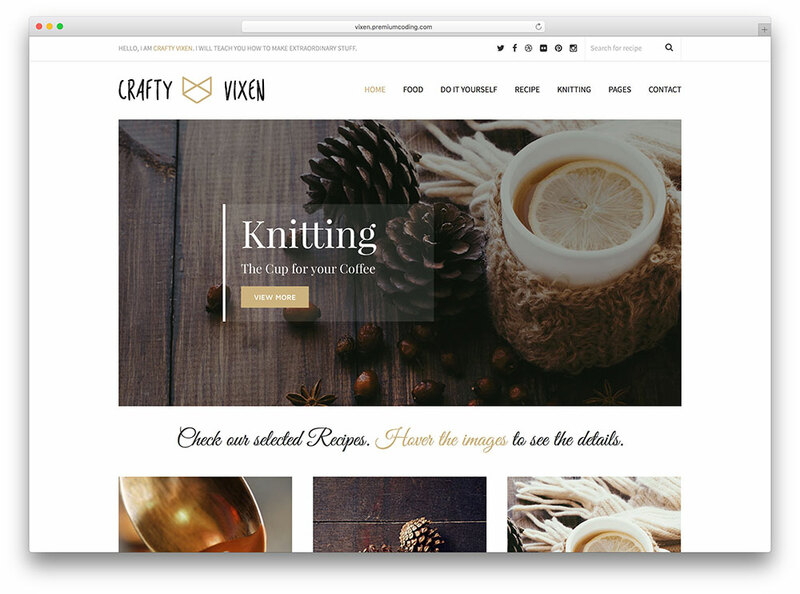 Vixen is an easy to use, professional, creative WordPress Feminine blog and portfolio theme, founded on the notions of intuitiveness, elegance, and femininity. 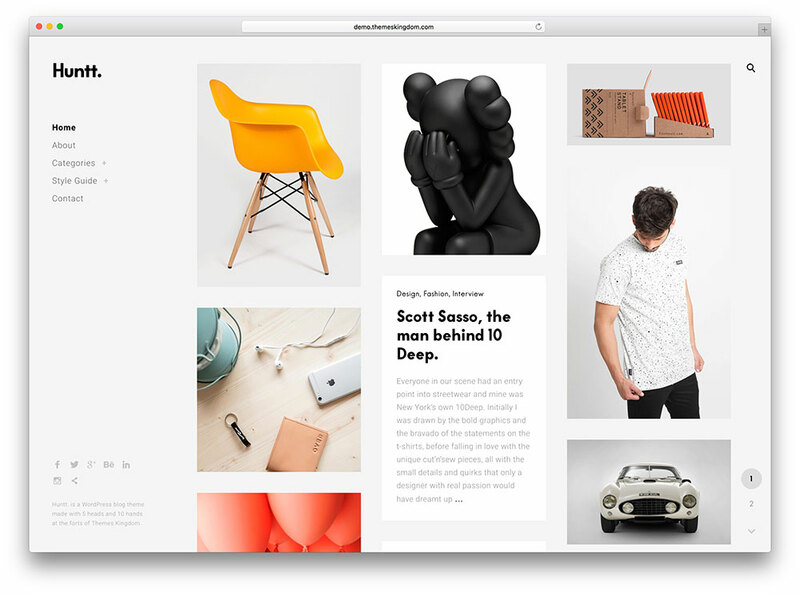 Huntt is a clean, modern, beautiful WordPress personal blog and portfolio theme, ideally suited for webmasters offering their viewers a very visual oriented content stream that needs to be distributed to a wide audience.